If there was a tract of land in desperate need of protection, Everglades National Park is it. In 1947, that’s what Congress did; by establishing its national park status it preserved the biological diversity and resources of the Everglades ecosystems. This is the largest subtropical wilderness in the United States, that contains a mix of freshwater and coastal prairie, mangroves, marshland, pine and cypress woods, and the waters and islands of Florida Bay. 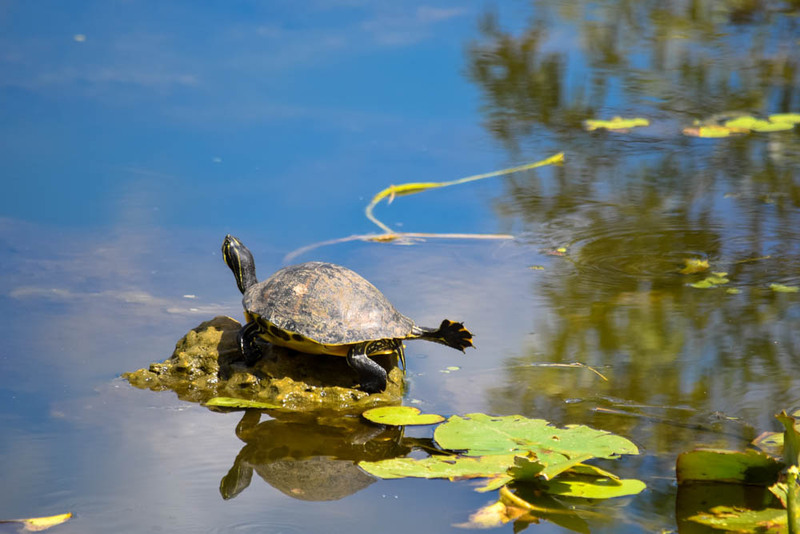 Upstream from the Everglades, over development and agriculture continue to diminish watery habitat homes of wildlife animals, including tropical wading birds and the endangered Florida manatee. All that protection at the southern tip could be pointless if water flow isn’t preserved. 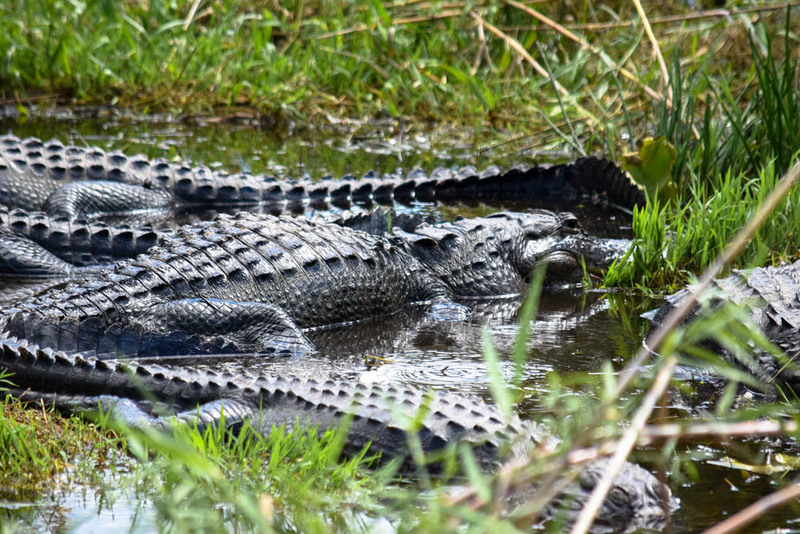 This is why I found it necessary to visit Everglades National Park: for unique environments and a chance to see wildlife not found anywhere else in North America. Hitch and I finally found our way to Everglades just a few days shy into April, just before the rains come sweeping into Florida. From December to March (also known as the dry season) wading birds and other wildlife are abundant and easy to spot. It’s also the season when ranger programs are at their peak. According to the guides, the wet season (April to November) brings mosquitos, heat, and humidity — a trifecta we definitely want to avoid! Early in the morning, we make our way to the Royal Palm Visitor Center. 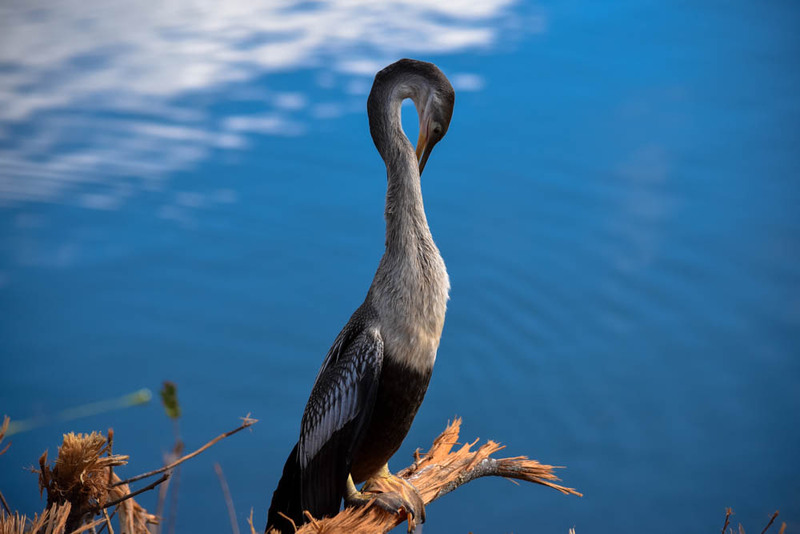 We don’t have to wait long for our ranger guide to show up for the free Anhinga Trail Talk. In the outdoor meeting area, she quickly goes over information about the park, and about the Anhinga Trail itself. As she guides us through the 0.8-mile trail, she points out all manner of wildlife. During the dry season, the shrinking water concentrates the wildlife, thus making animals easier to see. In the water, we spot fish such as gar, bass, crappie, and catfish. Birds, especially the Anhinga, are plenteous as they nest and rear their chicks all over the tree lines. Various heron species wade in the water hunting for fish, while anhingas and cormorants dive and swim for their prey. In the water and along the bank, alligators seem to laze about. Some are in pits or depressions, which the alligator forms for itself, right next to its food source. Don’t let their lethargy fool you, they can move pretty quickly when needed. During the dry season, they gather in numbers to breed. That day on the trail we counted well over 30 alligators. Overall, a fantastic trail for the avid birder and wildlife enthusiast. If you go, bring your camera and binoculars, and take the guided tour to learn as you go. Later on in the afternoon, we head over to the Flamingo Visitor Center, to join a Ranger-led car caravan tour of the park. 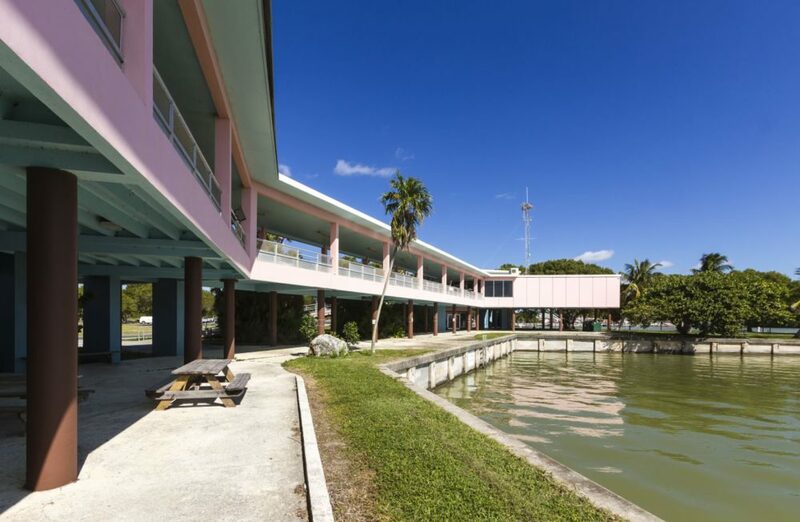 The visitor center itself is perfunctory, but it’s where you can get tickets for the boat tour. In addition to educational displays, they have informational brochures and backcountry permits. Nearby is Buttonwood Cafe, which is only open during the winter. When our ranger arrives, we go over our itinerary before heading out to our cars. Our first stop is Mrazek Pond. According to our guide, most of the year only a few ducks and wading birds. In the winter, large numbers of wading birds, including Roseate Spoonbills and Wood Storks, move in for the bountiful food. We take a moment to learn about Spoonbills, our ranger informs us about how they use to be copious in the southeast until the 1860s. At that time, spoonbills were virtually eliminated from the United States as a side-effect of the destruction of wader colonies by plume hunters. It was only in the late 20th century, that they began to re-colonize Texas and Florida. 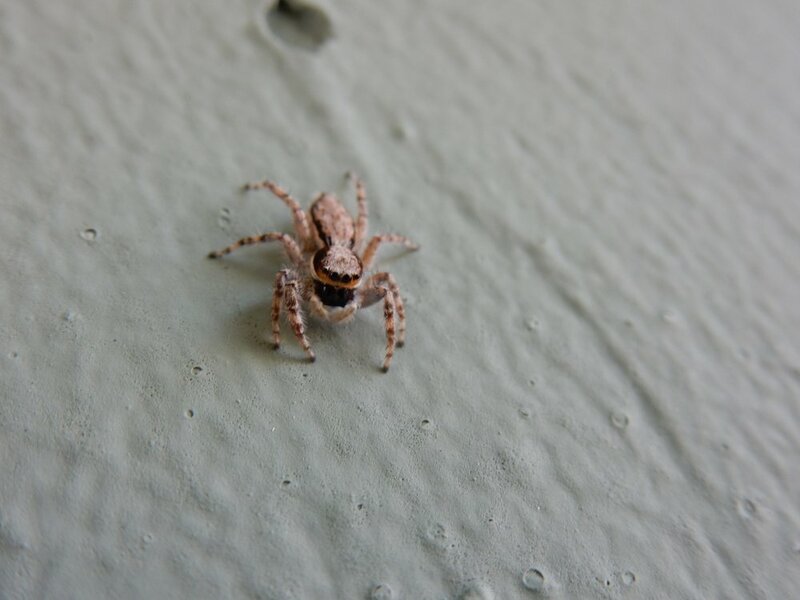 While at one of our stops we found Everglade Jumping Spider! Hitch took this video!“What about flamingos?” Asked another person in our group. Our ranger perks up with a detailed answer: in the early 1800s, there were hundreds of thousands of American Flamingos. They were common in Central, South America, and the Caribbean, but wintered in Florida’s tropical climes. Sadly by the end of the century, European settlers annihilated the leggy waders through feather and egg harvesting, and ever since the birds have been scarce in Florida — that is until recently. In 2014, the year a flamboyance (the exquisitely poetic name for a flock of the big pink birds) of 147 flamingos roosted in a 15,500-acre storm-water treatment area called STA-2. Since then their numbers have been steadily growing as they return each season, sometime in late March through the end of May. After our lengthy discussion about Flamingos, we gather back into our cars and make our way to West Lake Trail. Typically a self-guided boardwalk trail, today we have the benefit of our guide. We trek through a forest containing all three colors of mangroves: white, red, and black. There are also buttonwood trees and giant leather ferns that rise up from the forest floor. Where there is a clearing, thousands of pneumatophores protrude from the sand like tiny fingers. These are the breathing roots of the black mangroves, and in between each, spiders spin their lacy webs. At the edge of West Lake, water laps against red mangroves. Here our ranger stops to show us the thick layer of salt that covers their roots. The red mangroves transpire the salt as they soak in the brackish water. As we turn to complete the loop, we try to spot American crocodiles and birds. We only catch a glimpse of an osprey as it dives down for its fishy prey. turtles, and fish call home. Our guide says the canoe trip is worth it, and the 5-mile loop only takes about 4 hours to complete at a leisurely pace. Not many birds or wildlife were there, so we make motions to our cars. Before we leave, I quickly ask, “If the loop is five miles, why is it called Nine Mile Pond?” The answer is simple: a late 1700s homesteader lived in a now-gone cabin at the lake edge. It took him and his family nine miles to travel to church each Sunday. For our final stop, we are treated to a fantastic sight: a multi-species nesting colony! From the far shore and a set of good binoculars, we spotted Roseate Spoonbills, Great Egrets, White Ibis, Snowy Egrets, Tricolored Herons, Little Blue Herons, Black-crowned Night Herons, Great Blue Herons, and Anhingas. But out of all nesting species, the Wood Stork stands out. And boy do they stand out! Each adult Wood Stork is nearly 4-feet tall, and their in-flight span can reach nearly six feet wide. Their bald wrinkled heads and large bills seem menacing. Hidden among the trees we hear the noisy begging calls of Young Wood Storks, while the adults hiss and bill-clap. I feel a sense of awe as we watch an adult fly away with heavy slow wingbeats. 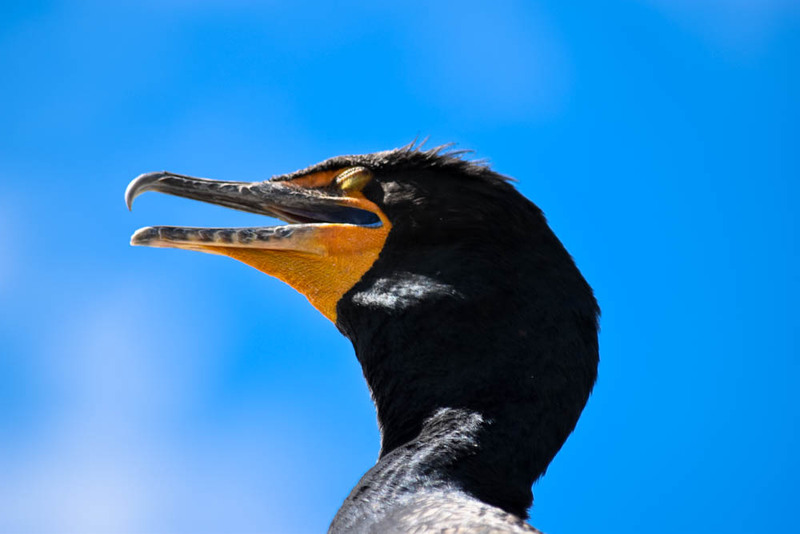 Our ranger guide informs us that there are usually over 400 nesting pairs in the area. As our Ranger departs, we bid her gracious thanks and farewell. We stay to watch the birds soar against a golden sunset. A pleasant way to end our day at Everglades National Park.